Comodo® SSL Certificates are one of the quickest and most cost effective solutions for any online business looking to protect their customer’s transactions with a high level of security assurance. With their root certificate embedded in all major browsers and devises they have a 99.9% compatibility rate with all modern browsers and mobile devices. Their digital SSL/TLS Certificates will secure your site or web server with full 256-bit encryption, unlimited licensing and up to $1,750,000 in Warranty. All major browsers and devices support certificates issued by comodo by trusting their root and intemediate certificates. You can have your new certificate issued under a SHA-1 Root to allow for compatibility with older devices and browsers. You can also be issue with a full SHA2-Root for best security practice. This option is provided to you during your configuration steps. Add the included Secure Site Seal to you website to give your customer more trust in your brand. 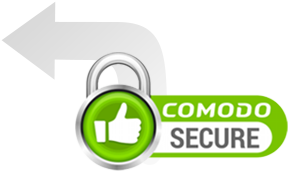 The Comodo SSL Certificates which include a Dynamic Site Seal will allow your visitors to click on the Seal. Upon clicking the Seal, a new window will open show your business as verified by a trusted 3rd Party. If your new SSL does not provide a Dynamic Seal, it will have a included Static Seal. These can be placed on your website to show the type of SSL you are using. Founded in the UK in 1998, and relocating to the United States in 2004. 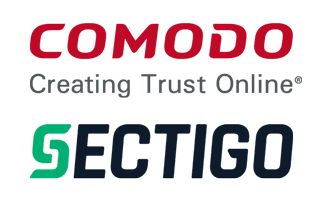 Comodo become the largest digital certificate provider in 2018. They have fast become a leader of the industry, helping to set standards by contributing to the Internet Engineering Task Force (IETF). In 2005 they became a founding member of the CA/Browser Forum. A discussion to create a central authority for delivering best practice guidelines for digital certificate issuance. From the 1st November 2018, the company will be rebranding under the new name Sectigo. We have our installation service available to help you install your new Certificate, quickly and easily. We can also help with the initial configuration to get your business and domain validation done smoothly with any requirments. SSLTrust & Comodo Review Ratings of 4.9/5 from 336 reviews. The PositiveSSL is one of the most affordable SSLs we have available today. You can be up and running with full 256-bit encryption in minutes. A perfect solution when you need to secure multiple domains or a MS Exchange setup. You can be setup in minutes and add/edit or remove domains for the secure domain list at anytime. Securing all your subdomains has never been easier using a PositiveSSL Wildcard to do the job. Issued in minutes with domain validation you will have your domain and unlimited subdomains secured. Another great and cheap solutions from Comodo is the EssentialSSL which can have you up and running in minutes without breaking the budget. Need to secure multiple services such as your website, ftp server, mail server and more? This Essential Wildcard Certificate provides a great solution and can have you secured with 256-bit encryption quickly. One of the most affordable Business Verification Comodo SSL Certificateavailable today, and from one of the leading and most trusted brands in the industry, the InstantSSL shows clearly to your visitors the authenticity of your business. With a greater warranty and a Dynamic Site Seal which is highly recognizable by your visitors, this InstantSSL Certificate can be a good choice when you need something that little extra to give visitors more trust in their security while communicating important information with you. This leading Wildcard Cert has the verification of your business shown to your users to give them peace of mind in knowing their privacy and communication is secure with you. A great choice for any business, school or legal entity needing to secure all subdomains. You can't get much better than this. Get your EV Cert today and start showing the Green Address Bar to your visitors to give them absolute trust in your business and authenticity. Perfect for any e-commerce website. When you need to secure more than one domain name on an unlimited number of servers then this multi-domain Comodo SSL Certificate is perfect. Being a business validated Certificate means you have the backing of an industry leader to show your customers, promoting their trust in your business. With the ability to secure multiple domain names including an unlimited number of subdomains for each domain this Certificate is one of a kind. We were one of the very first to offer this unique SSL and are now one of the top providers. Secure 2 domains and associated subdomains in a standard order, with the ability to secure up to 100. When may need to secure more then one domain under a single certificate. But how about showing the Green Address Bar on each one of these domains? 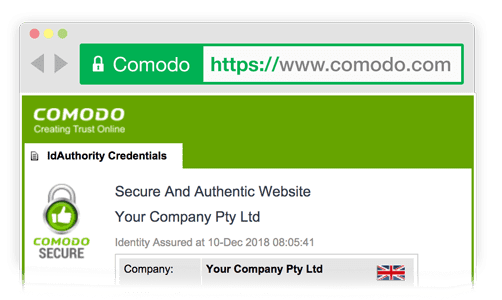 With this Comodo Multi-Domain Extended Validation SSL you can let your customers know you are serious with security and privacy and are a well-established business or brand for all your domains. Built with the intent to be used with Microsoft Exchange Servers, this UCC Digital Certificate is a great choice for any business, school or legal entity needing to get secured quick and easy. A Unified Communication Certificate built to be used for MS Exchange setups, which can also be used for any services needing full 256-bit encryption. Show you are serious with the business verification in a UCC SSL. A new SSL from the Positive SSL range to make the Green Bar EV Certificates even more affordable. Complete with the highest level of 256-bit encryption, Extended Validation, Warranty and the highly trusted Green Address Bar. When you need to secure your code and content for any software or apps your users are downloading. Use these Code Signing Certificates for great affordability, large platform support and quick issuance. Need a quick solution in minutes until you find the right one to get your business, website, blog or mail secured? Try the this SSL for 90 days, absolutely free.